WHAT: On Monday, April 22n, at 4:00PM, we're delighted to host an uncommon dialogue with lifelong Gandhian, Arun Bhatt, at the SAP headquarters in Palo Alto. To join us, RSVP below. 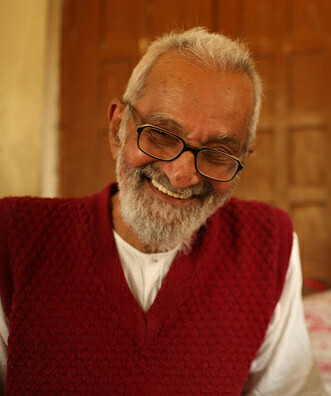 Arun Bhatt ("Arun-dada") spent decades serving alongside a Gandhian legend, Vinoba Bhave. Walking from village to village all across India, for tens of thousands of miles, he served uplifting the grassroots. As a part of the "Shanti Sena" (peace army), he breathed peace in warring areas -- often in the most remarkable ways. For 13 years, he went to jail every month for a peaceful protest to protect animal life. Stories of how he has transformed lives are almost like folk tales. To top it all off, he did this without owning anything, and selling any of his labor -- ever. Just simply, and powerfully, the power of love. Now, at 86 years of age, his eyes are still shining, his heart still pours out soulful songs, and his presence quietly blesses -- without ever trying to.